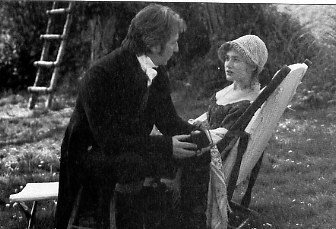 In 1996 on Austen-l and in 1999 on Janeites scheduled group conversations of Jane Austen's Sense and Sensibility occurred. On both lists we also read and discussed a series of critical books which included critical essays on Sense and Sensibility. I posted continually during all these conversations, and have brought together in one place a very few of my essay-postings, interventions and responses to others during these online discussions. As with all the other group conversation and single essays I have placed on the Net form such conversations, I have altered the postings slightly so as to make for continuity and have occasionally rearranged them so the reader can follow the conversation as one would a story. Read as a series they form a close reading of Sense and Sensibility against a scholarly critical background. I argue elsewhere that a study of the calendar in the extant Sense and Sensibility suggests the strong probability that the novel was originally epistolary; I also review the recent film adaptations of Jane Austen's novels as Jane Austen in Film. Tony Tanner on "Secresy and Sickness"
Shattuck on "The Pleasures of Abstinence"
"That Sanguine Expectation of Happiness which is Happiness Itself"
The Meaning of the Title: Criss-crossing Complex words"
"Each for the sake of the others resolved to appear happy"
"He insisted on conveying all their letters . . . "